Home > Conditions > Can I still get polio? Planning to travel to remote areas internationally? This is what you should know about polio (a virus known to cause paralysis) and its prevention. Although polio has been fully-eradicated in South Africa and the majority of the world since the late 1980s, polio infections still occur sporadically in a few developing countries such as Pakistan, Afghanistan and Nigeria. The good news is that the number of polio cases has decreased dramatically – from an estimated 350 000 in 1988, to a mere 22 reported cases in 2017. That means five million children have already benefitted from successful vaccination initiatives over that time period. The wild poliovirus (poliomyelitis) is a simple virus. Once ingested, the virus replicates in the cells of the gastrointestinal tract. New virus particles are released into the intestinal tract and excreted in the stool of the infected person. As a result, it is transmitted from person-to-person through contact with virus-containing faeces or contaminated water. After entering and then replicating in the gastrointestinal tract, the poliovirus may enter the spinal cord and brain. The breakdown of motor neurons by the virus can lead to irreversible limb paralysis. This complication happens in approximately one in 200 cases. Among those who are paralysed, 5% to 10% die when their breathing muscles become paralysed (according to data from the World Health Organization). Polio is particularly virulent (active) in children under five years old and up to 90% of infections occur in young children. Two vaccines were developed for polio (from as far back as the 1950s): the inactivated polio vaccine (IPV) and the live, oral polio vaccine (OPV). Both vaccines protect against all three types of the poliovirus. Can you get polio from vaccinations? Yes, from the live OPV, but very rarely. In the USA the CDC recommends IPV only for this reason. Since the development of the OPV vaccine, two more rare forms of the polio infection called vaccine-associated paralytic polio (VAPP) and vaccine-derived poliovirus (VPDV) have been described. Vaccine-associated paralytic poliomyelitis (VAPP) occurs when someone who received or ingested the live oral polio vaccine drops develops a similar type of paralysis to the one associated with the wild virus. However, it is extremely rare, occurring in only approximately 1 in 2.7 million people who have been dosed with OPV, according to WHO data. 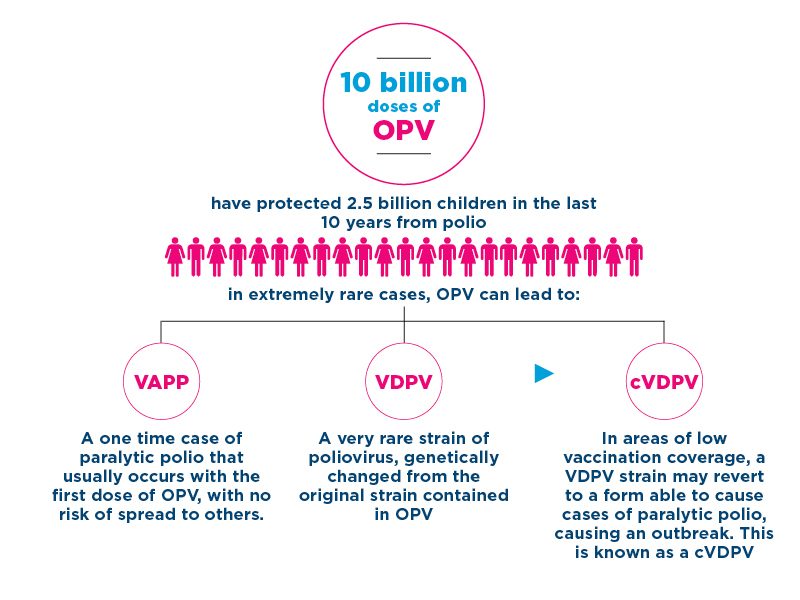 A vaccine-derived poliovirus (VDPV), on the other hand, is a strain of the weakened poliovirus that was initially included in the oral polio vaccine (OPV) and has changed over time. As a result, it behaves like the wild or naturally-occurring virus, giving it the ability to spread more easily to unvaccinated people. If it starts circulating in the population, it is called circulating vaccine-derived poliovirus (cVDPV). For this reason, the global plan for eradication of polio has included replacing orally administered OPV with injectable IPV in routine immunisation. As IPV is not a ‘live’ vaccine, it carries no risk of VAPP and also triggers an excellent protective immune response in most people. A fully-immunised population will be protected against both vaccine-derived and wild polioviruses. Low vaccination coverage is a major risk factor for the emergence of cVDPV. Despite the excellent progress achieved since 1988, as long as a single child remains infected with poliovirus, children all over the world are at risk. With the ease of travel in the 21st century, the poliovirus can easily be imported into a polio-free country and can spread rapidly in unimmunised populations. In fact, the World Health Organization estimates that failure to eradicate polio could result in as many as 200,000 new cases within ten years, with the added risk of escalating exponentially thereafter. How can polio be prevented/treated? Adult travellers intending to visit polio risk areas and who are unvaccinated, incompletely vaccinated, or whose vaccination status is unknown should receive a series of three doses of DTaP-IPV-Hib. a third dose six to 12 months after the second dose. Adults who completed the polio vaccine series as children and are travelling to areas with an increased risk of polio should receive a one-time booster dose of IPV. Why has smallpox been fully eradicated but not polio? The only virus eradicated to date has been the smallpox virus. The poliovirus is a similarly good candidate for full eradication because it is only transmitted among humans (not animals) and it does not survive for long periods outside the human body. However, the one major difference between smallpox eradication and polio eradication is that smallpox was easily detectable even to the untrained eye, whereas polio is easy to miss or misdiagnose. It takes years of tracking a disease and countless workers to administer vaccines in order to fully eradicate it.